Research funded by Airweave has found that the brand’s “high rebound mattresses” provide more restorative sleep at the initial phase of slumber than “low rebound mattresses” built with memory foam. The study took place in Ota Memorial Sleep Center in Japan and evaluated effects on sleep-related physiological parameters, including brain wave and core body temperature. The participants were broken into two separate groups, one comprised of 10 young male adults with an average age of 26 and the second composed of 20 healthy older men with an average age of 61. All the participants blindly slept on either the Airweave topper (categorized as “high rebound” because of its buoyant, firm plastic fiber construction) or a memory foam topper from Tempur-Sealy (considered “low rebound” because of its deep body contouring). An overnight standard sleep polysomnograph (PSG) was performed whilst the subjects dozed, measuring things like heart rate, body temperature, and brain wave activity. Each participant slumbered on both types of mattresses, one night each, with a 1-2 night break in between. In both evaluations, subjects fell asleep much faster when sleeping on the high rebound mattresses, with a drop in core temperature being a significant reason why participants rapidly entered the first phase of sleep. It might raise some people’s eyebrows to see a mattress study that uses Airweave mattresses also be funded by the same mattress company. Concerns of research validity and transparency are valid, especially when scientific inquiry works best when it’s objective. According to Vanessa Rojas, Marketing Director at Airweave, these worries are assuaged by the fact the study was published in an unaffiliated review. Airweave is hardly the only bedding company to fund research into its products. Other bedding brands have investigated connections between their wares and common disorders such as sleep apnea and sleep latency. 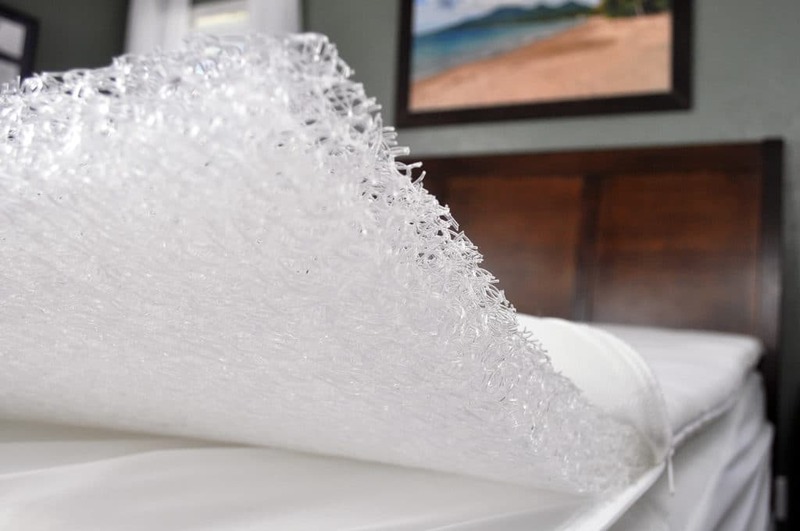 And some have made sure to utilize certain mattress materials, like Celliant, which is backed by scientific research and approved by the FDA. For its part, the airweave research team acknowledges there are limitations in the study itself, such as small sample size and the temperature of the room participants slept in. It’s also worth noting that the study didn’t delve into the topper’s effects on deeper parts of the sleep cycle, such as REM sleep. As is often the case with positive results, when things are promising, more research should be done to strengthen the findings.